5xmom – Why did I marry a GM instead leh? 5xmom – People’s wife bought things 4 times more expensive than me. Two thousarn egg hunled sickty pai (RM2,865) and she paid in crispy RM100 notes sumore. No need to queue up like me, using gold card and bonuslink, chey…. 5xdad – *haih* People just throw in one pig only mah, sap sap sui. OK, go ahead and snigger (eleh, miserable skin care only mah…) but this is the very first time, in the last 6 years since I resigned from work, that I spend about RM700+ on just a skincare set. Ladies, go and pamper yourself silly. Don’t worry, be happy. 5xdad – na mo ami tha ba! sin zhoi sin zhoi! 5xmom – zui guo zui guo!! Ei, if not mistaken I see u got one extra small bottle of Miracle Water **poing-ping** I want I want !! It’s gonna take u ages to finish using it. I bought one last March (150ml), now still got some left. Good investment! Joez – Yeap, I bought above RM650, got free whitening mask 2 pcs, two miniature bottles of that (I haven’t read brochures, dunno how to use oso) and that faux leather casing. But hor, everyone si beh rich wan leh…They can buy exceeding thousands of ringgit wor. Then hor, I compare their faces (they seems like regular users lah ‘cos know the products so well) also kalah to my St. Ives face. Chey….. I radiant-radiant, not so spotty, no wrinkles….but they big-big pores lor. Hahahaha, I am so bitchy and sour grape. Twinsmom – Kenot, kenot. Tonight I grab and go to sleep, drooling myself. Eh what for you want the whitening mask? Use bedak sejuk can adi lah! fuah…RM 700 ! Show us result hor. What about something called La Mer Creme. That miracle cream cost S$200-300 per small bottle. They say miracle cream! ET – Ya, La Mer, RM680. I hope I don’t get caught in the vicious cycle and follow the crowd. You know lah, women did that all the time. The older they grow, the more vain they become. laalalal~ SKII.. women are soooososososososoo vain :P.. i think eggyolk does the same trick. Munkit, and so did 20 tablespoons. 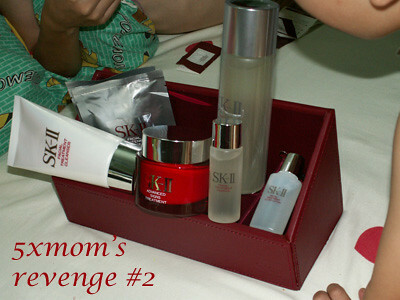 wah..SK II wor! you must be very rich lor. Women must know how to pamper themselves, women must always look good. That’s what my mom ALWAYS tells me. My mom always say I should put on some make up- young adult already, but I malaslah. only put on make up on special occasions. Pingback: 5xmom » WTF?!? Male needs skincare?